What is a Trucking Accident? | The Voss Law Firm, P.C. What exactly is a Trucking Accident Under the Law? Every year thousands of motorists are killed by large trucks -- those weighing more than 10,000 pounds. 18-wheelers, semi-trucks, tractor-trailers and semis fall into this category. The Federal Motor Carrier Safety Administration establishes rules and regulations which govern commercial motor vehicles and the companies who operate these vehicles. Federal law requires commercial vehicles traveling in interstate commerce to carry insurance for bodily injury and property damage. Truck drivers and the companies they work for have a duty and legal responsibility to operate their vehicles in a safe manner. There are specific Vehicle Code sections which apply only to commercial truck drivers and trucking companies and there are special licensing and training requirements of truck drivers. Unfortunately, some trucking companies and even some insurance companies treat injured victims unfairly often putting pressure on them not to seek legal assistance even when they are severely injured or killed through no fault of their own. Cliff Roberts and his firm are specifically dedicated to recovering money damages from these trucking companies as compensation for those who are wrongfully injured or killed by negligent truck drivers. A majority of trucking cases that we accept can be settled prior to trial and a number of cases can even be settled before filing a lawsuit; however, if the responsible parties are not offering a fair cash settlement a lawsuit may be filed against any person or entity who was at fault for causing the accident. 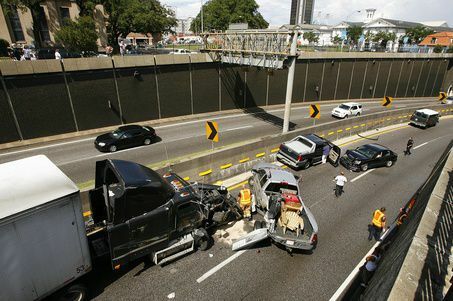 This includes the truck driver, the trucking company, the owner of the trailer, the shipper, as well as any other driver, person or entity who in anyway contributed to the accident, such as the manufacturer of one of the vehicles involved in the accident, the manufacturer of a tire that contributed to the accident or the owner of any public or private property whose negligence contributed to the accident. Although our firm cannot guarantee a recovery, money damages that are generally sought for accident victims include money for a victim's past and future: physical and mental pain and suffering, mental anguish, disfigurement, physical and mental impairment, medical expenses, loss of earnings, and prejudgment and postjudgment interest. In addition, compensation in select cases may also be awarded for loss of consortium, loss of household services, loss of services of a minor child, loss of part of the body, loss of mental and intellectual functioning, loss of enjoyment of life, loss of inheritance, bystander emotional and mental anguish, loss of chance, pecuniary loss, loss of love and affection, and funeral and burial expenses. Furthermore, punitive damages may be sought in cases where the responsible party acted with malice. Large truck cases involving catastrophic injury or death require enormous and costly case preparation which may include one or all of the following: extensive accident scene investigation, high tech photography, in depth witness interviews and preparation, detailed medical records retrieved; experts in the medical, economic, reconstruction and many other fields are generally interviewed and/or retained. State of the art demonstrative evidence will also generally be compiled, including computer simulations; medical illustrations; flow charts on damages; scaled models; and day-in-the-life video projections. Our firm also has networking capabilities throughout the United States with the capacity of using national database exchanges. Case preparation will also be followed by a comprehensive legal and factual investigation. To consult Motor Vehicle laws and regulations in your State visit your Department of Motor Vehicles or contact The Voss Law Firm, P.C. for a free consultation.